Abraham Bedford Venable (November 20, 1758 – December 26, 1811) was a representative and senator from Virginia. He was the uncle of congressman Abraham Watkins Venable. 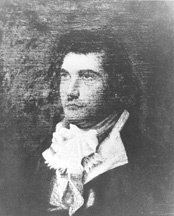 Born on "State Hill", a farm in what is now Worsham, Prince Edward County, Virginia, Venable attended Hampden–Sydney College and later graduated from the College of New Jersey in 1780. He worked as a planter and studied law in his hometown, eventually being admitted to the bar in 1784. He started practice at the Prince Edward Court House in Prince Edward County, Virginia. He later got involved in politics and was elected to the Second Congress, serving from 1791 to 1799. He served as chairman of the Committee on Elections in the Fourth Congress. He was later elected to the Senate to fill a vacancy, serving from 1803 to 1804 when he resigned to become president of Bank of Virginia. He died in 1811 in a theater fire in Richmond, Virginia. His ashes were placed under a rock at Monumental Church in Richmond with the ashes of other victims of the fire, including Virginia Governor George William Smith. His family included his nephew Abraham Watkins Venable. 1790; Venable was elected to the U.S House of Representatives unopposed. 1793; Venable was re-elected with 79.21% of the vote, defeating Independents Thomas Woodson, Joseph Wiatt, and Thomas Scott. 1795; Venable was re-elected 90.6% of the vote, defeating Independent Tarlton Woodson. 1797; Venable was re-elected unopposed. United States Congress. "Abraham B. Venable (id: V000083)". Biographical Directory of the United States Congress.